Newly manufactured Wolf Polyformance. 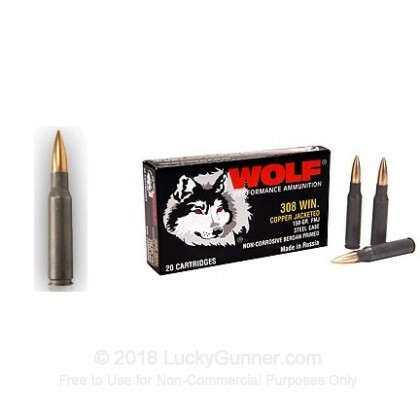 Wolf ammunition has been the leader in steel cased ammunition for quite some time and continues to deliver quality product at an affordable price. This ammo was manufactured in one of Wolf's legendary production facilities in Russia. This product is steel-cased, berdan-primed, non-corrosive, and non-reloadable. Love the ammo I purchased. Great value . Not bad for stock pile ammo. The service from lucky gunner was great despite the in accuracy of the ammo. Spot on I will use them again real soon. Myself and two of my friends bought 1000 rounds and haven't had any problems whatsoever. We are all very pleased. Also very happy with the service @ lucky gunner!